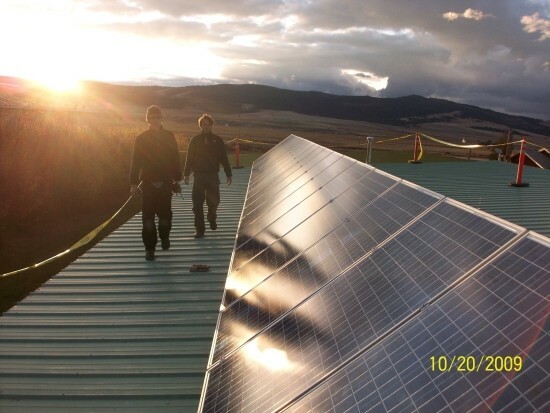 The 20 panel 4 kW grid-tied system at the Pintler Ranger Station in Phillipsburg, MT was one of three systems SBS designed and installed for the National Forest Service in 2009. At the end of first day, above, we had all of the rack mounted panels on the roof of their storage shed. The three forest service projects, all 4 kW systems, are utility interactive and are expected to produce a cumulative total of 16,500 kWh annually. This will prevent the release of 15,000 lbs of greenhouse gasses into the atmosphere each year.